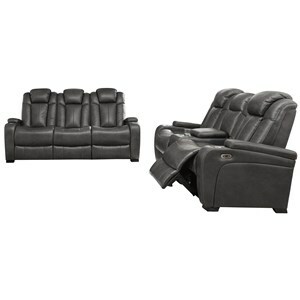 Contemporary style, comfort, and convenience converge with this power reclining loveseat with a center console. 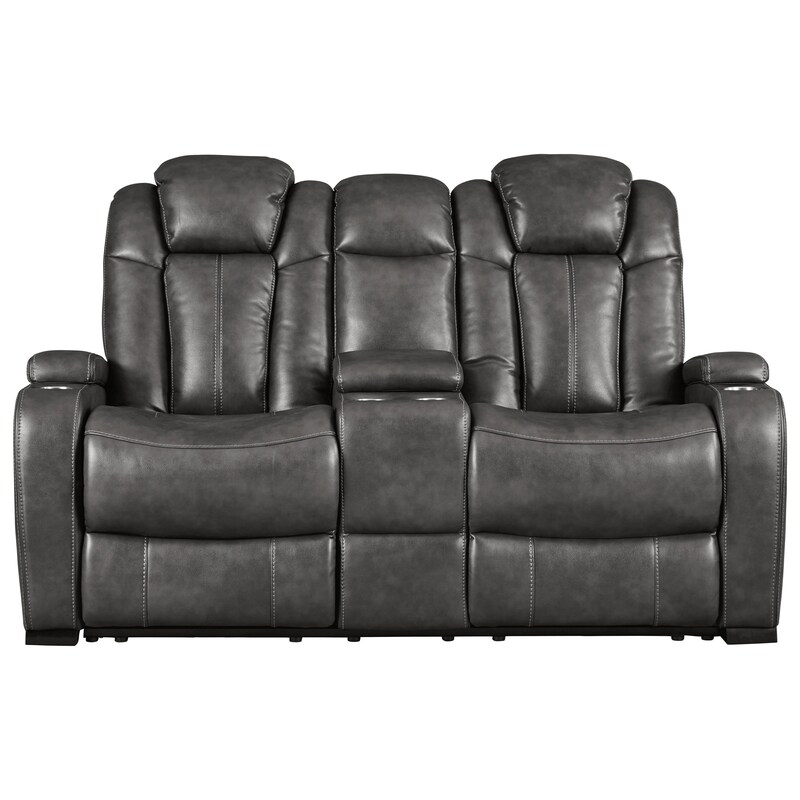 Featuring dark gray faux leather upholstery, the reclining loveseat keeps you cozy with two Easy View™ power adjustable headrests and power recline. 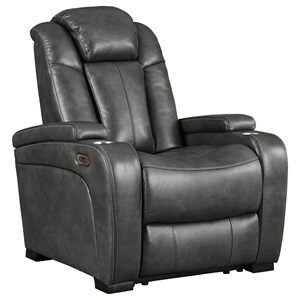 Four stainless steel cup holders and built-in USB charging make it easy to relax. 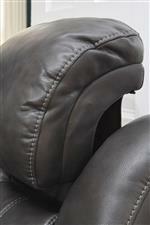 Rounded track arms, accent stitching, and block feet take the loveseat's look to the next level. 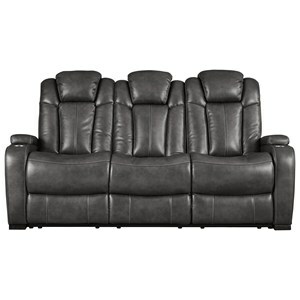 The Turbulance Contemporary Faux Leather Power Reclining Loveseat w/ Console & Power Headrests by Signature Design by Ashley at Value City Furniture in the New Jersey, NJ, Staten Island, Hoboken area. Product availability may vary. Contact us for the most current availability on this product. 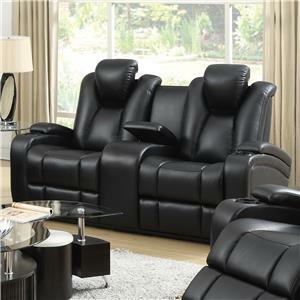 Lounge to your heart's content with this power reclining furniture collection. 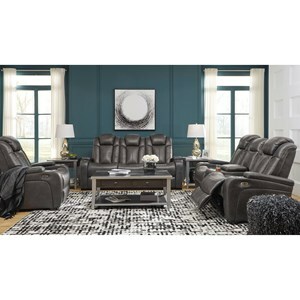 Your living room is set for contemporary style, comfort, and modern convenience with your choice of pieces available in dark gray faux leather. The Turbulance collection is a great option if you are looking for furniture in the New Jersey, NJ, Staten Island, Hoboken area. 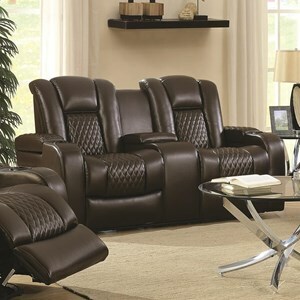 Browse other items in the Turbulance collection from Value City Furniture in the New Jersey, NJ, Staten Island, Hoboken area.